Give us this day our daily bread….. In deepening my work around sustainability, I find that I need a daily practice routine that is a ‘time out’ to help ground myself in a busy schedule. I have never found meditation engaging enough to become a steady habit. I do like food though and good food at that and I also like cooking, so baking bread is really enjoyable to me. 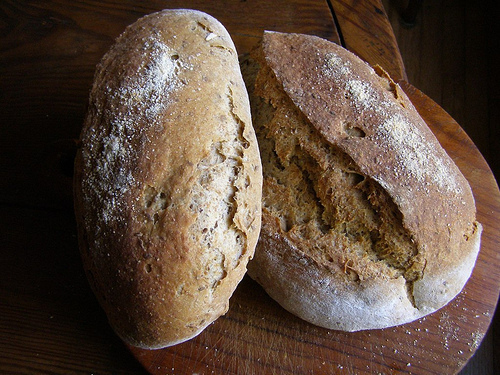 I have found that bread baking provides a link to both the environment and to a timelessness that is enriching. 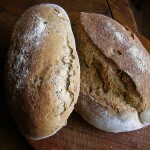 As I practice bread baking more and more it is attaining a deeper meaning also. Recently, when reading Charles Eisenstein I was struck by his use of the word ‘sacred’ and it clicked – bread baking has almost a sacred quality to it and forms a wonderful reflective ‘time out’ in my schedule. To me, the word sacred was always associated with standard religious practice so, as an atheist, the word never resonated with me. Eisenstein uses the term to describe something that is to be honoured, to be practised with respect and reverence, not necessarily within a religious setting. By using organic materials and developing a simple ceremony around baking the task can come to build awareness on many levels. It can reflect awareness of the environmental issues we face; it can honour the work of many people along the supply chain; it can link us to our past and help us appreciate our ancestors’ lives; it can make us grateful for ‘what we are about to receive’; it can help us practice sustainability; and it can remind us that the sacred is all around us and we are enriched by acknowledging it. Oh, and homemade bread tastes wonderful too!